Camellia sasanqua (white cultivar) flower. Hello Gardeners, I’m Amanda McNulty with Clemson Extension and Making It Grow. 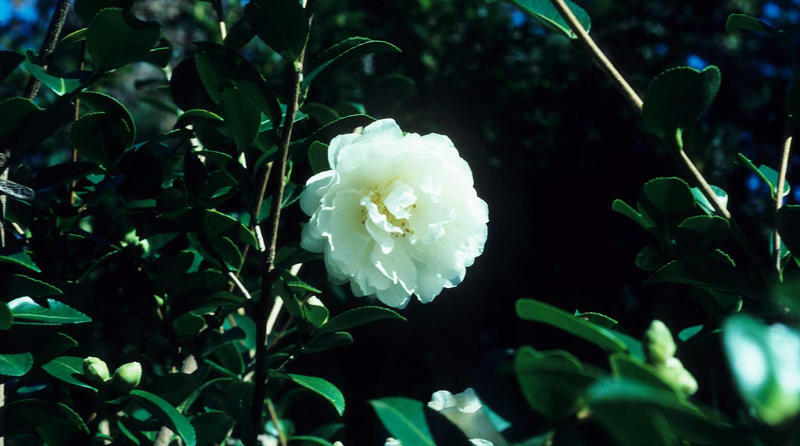 A backbone of Southern landscapes that is still in vogue today is the white, fall-flowering camellia sasanqua. At my husband’s grandmother’s house, some of those long-lived now tree-form specimens are thriving; they were planted by mother-in-law in 1927 and haven’t had a drop of care in the last fifty years. Another in-town relative, Carolyn Wimberly, redid her yard recently and planted several white sasanquas right by the sidewalk where my friends and I pass by on walks. All fall we marveled at the huge number of pollinators visiting these young, profusely flowering shrubs. Since frost was so late this year, the friendly pollinators had to compete with yellow-jackets, whose numbers keep increasing until a frost finally wipes out their colonies. Then the European honeybees which remain active during the winter when the weather is warm, can claim those flowers for their own.